So I received some phone cases I bought (off of ebay) for my Galaxy Note 3. My old glitter cases were boring and added a lot of unnecessary bulk to my already rather large phone. So I picked up a couple of plain ones. I decided to paint them since I didn’t want them to be too plain. Above are 2 of the finished cases. I’m personally in love with the palm leaves one, I couldn’t be happier with how it turned out. The pineapples are great too but I feel like the leaves have much more dimension than the pineapple portion. I guess I’m just really good at painting leaves. I sanded the cases and applied a matte medium as a base before painting them to really help the acrylic paint adhere, and then topped it off with a clear acrylic spray to seal everything. I’ve got a new member to my family of bones. This is… actually I don’t have a name for him yet but for some reason I feel like he might be a Luis. It’s a resin skull shaped planter, right now I’ve got my fake peonies (the ones I use for hair flowers) sticking into his head, but I might switch things up depending on the season and my mood. If you have a suggestion for what I should name him, let me know in the comments below. Also I bought him off Amazon. Recently finished my old sketchbook, so I had to start a new one. As much as I enjoy the fact that this cover is much easier to draw all over compared to my last one, I must say that I absolutely hate this sketchbook. The paper is not to my liking plus the binding of the book started coming apart after the first few uses. Now to be fair maybe I’m too aggressive with my sketchbooks but I think it’s because there was no ribbon or any extra support for the binding with this. Maybe I’ll add some to prevent it from falling apart but not a good move Picadilly. Aside from hating the sketchbook, the pretty palm leaves and pineapples were both done in some metallic markers. I like the markers. Zig Fudebiyori Metallic in Gold and Green. I saw the movie The Book of Life in theatres on November 2nd, 2014, and it became an instant love. (So much so I downloaded the sugar smash game version of it onto my phone). It was such a great movie, with an amazing soundtrack (which I bought and also have on my phone, and listen to daily), and all the little skulls, stars and hearts everywhere were awesome! Needless to say, as I was cleaning out my room I found an old corkboard/dry-erase board that I’d never used (probably because it was ugly). So after I red-did my room, I painted the corkboard. I think it’s much prettier now, and I’m more likely to use it, which is good because I need it to help me stay organised. I kind of want to make this as a fabric print now. I want to make a circle skirt out of this. Anyway, I might give it a light dusting of a glitter clear coat, because, why not. I’m already using it so it’s serving it’s purpose after probably 10 years of not being touched. Now all I need are star, and heart shaped push pins. 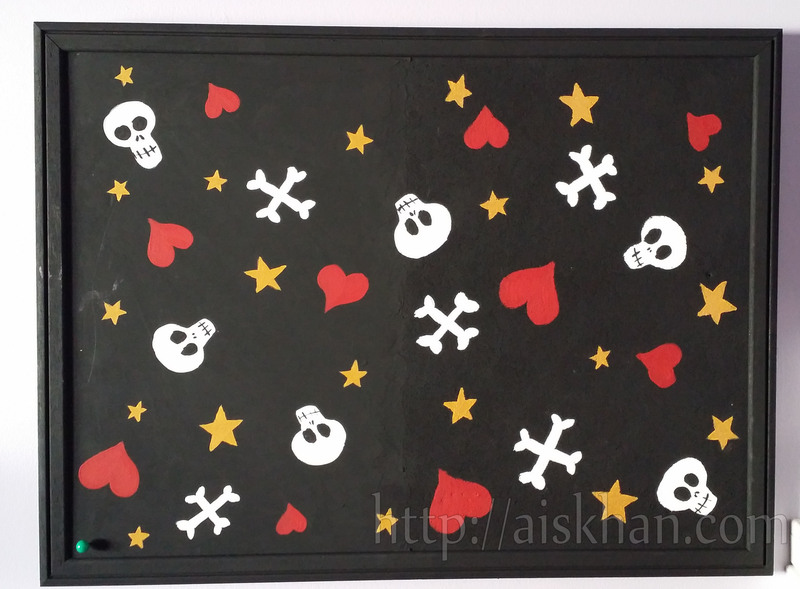 Done using acrylic craft paints in gold, white, red and black, all of this was hand painted, no stencils or stamps. This is from February, I would’ve posted it much earlier but I forgot. Sometimes I get crafty and paint on mugs. Only sometimes, and only for super special friends. This baby was a birthday gift for a close friend of mine who bought my friendship with sushi, and her being crazy trustworthy. 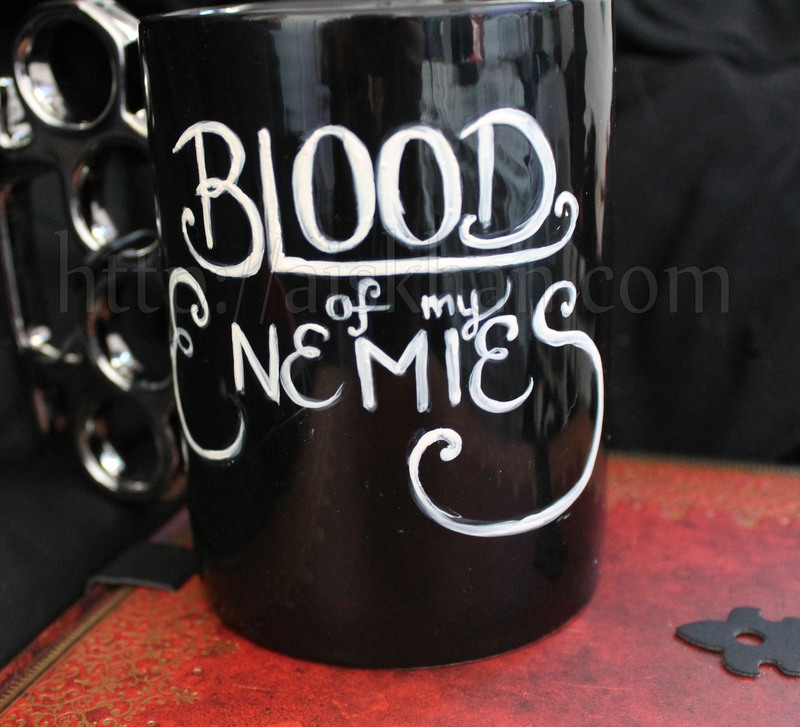 She had had a really rough year, so “Blood of my Enemies” seemed like it would work for her birthday. It took me about 50 times to get the writing nice looking in my sketchbook. 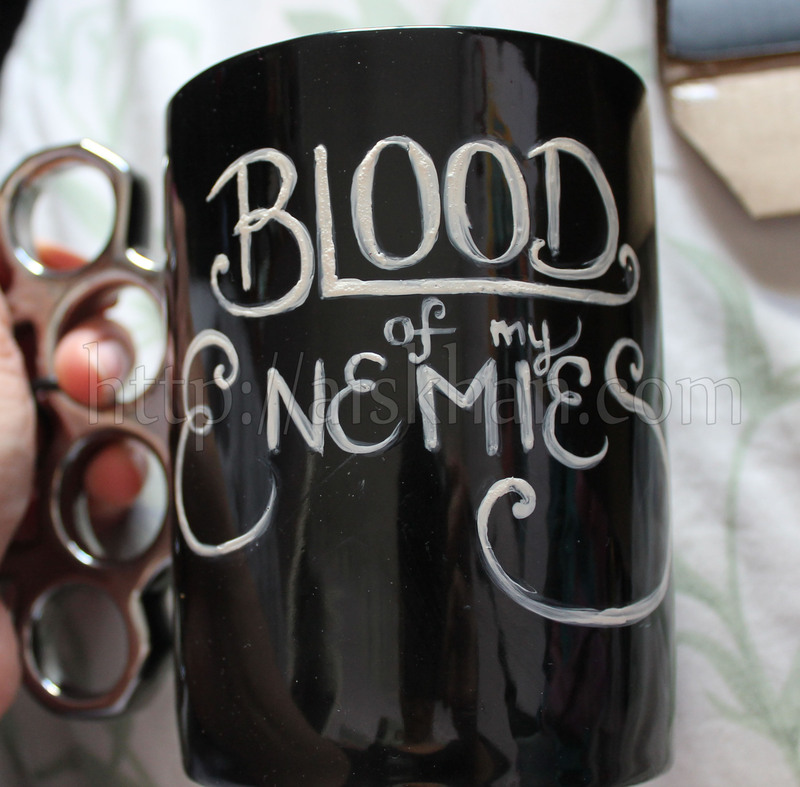 Pebeo Porcelaine Paints in White, mug is a Brass Knuckles mug from Think Geek.